The midterm elections that handed losses to many Democrats across the country haven’t resulted in much change for President Obama’s approval rating – it has barely moved in over a year and remains at 43%. In fact, the share of Americans approving of Obama has wavered between 41% and 45% in 13 consecutive Pew Research surveys dating back to September 2013. While Obama’s recent job approval isn’t high by historical standards, his second-term numbers overall have been more stable than those of his predecessors. Although many factors contribute to a president’s approval in the public’s eye, it often declines after an election when a president’s party loses. George W. Bush’s rating, for instance, dropped consistently after his 2004 reelection, including five points after his second midterm election in 2006 (to 32%), when Republicans lost control of both houses of Congress. Ronald Reagan, who entered the 1986 elections with a 63% approval rating, dropped 16 points by December — largely due to the damage done by the Iran-Contra affair, which came to light in November 1986. Like Obama, Reagan’s party gave up the Senate and lost seats in the House. Dwight Eisenhower’s job approval rating fell 5 points (57%-52%) in November 1958, according to Gallup, after a disastrous midterm for the GOP. Harry Truman’s rating declined 8 points (41%-33%) post-election in 1950, when Democrats barely held control of both houses. One president who fared well after his second midterm was Bill Clinton, whose approval rating hit 65% as his party gained House seats in his second midterm election (the only time this occurred in the 20th century). 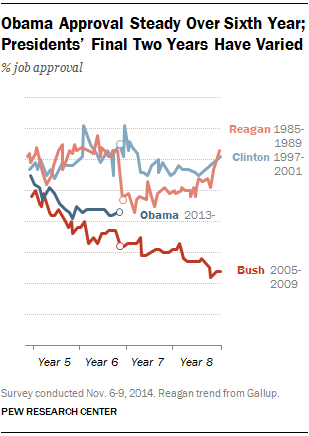 Over the entirety of a president’s second term, recent history shows that approval ratings vary widely. In the wake of the Iran-Contra affair, Reagan’s Gallup approval hovered around 50%, but he rebounded and left office with 63% support. Clinton dropped from a high of 71% around his early-1999 impeachment to 55%, but he left office with about six-in-ten approving of his job (61%). 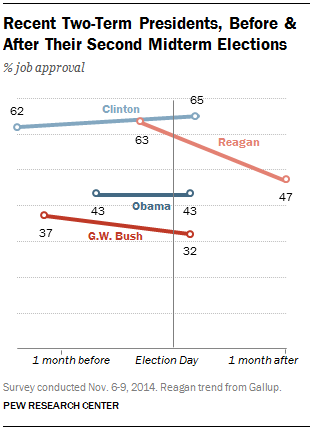 Bush continued to struggle in the homestretch of his presidency, finishing with the approval of about one-in-four Americans (24%). Despite Obama’s flat approval trend recently, most of the public was skeptical in Pew Research’s post-election survey last weekend that the president can accomplish a great deal (6%) or some (33%) of what he would like to do in his final two years. About six-in-ten (59%) think he will accomplish not much or nothing of what he wants to get done, similar to the sentiment eight years ago as Bush faced his lame duck status. The public is divided, though, about who should take the lead in solving the country’s problems: 40% say Obama and 41% choose Republican congressional leaders. By contrast, 51% wanted Democratic leaders in Congress to take the lead after the 2006 midterms and just 29% thought Bush should do so.